Just a quick update on unemployment insurance claims in Oregon. As the Oregonian notes, both the number of unemployment claims and the amount of benefits paid out has decreased in the past year. However the latest new weekly claim figures at the national level are higher than expected, but as Calculated Risk and Tim Duy note this could be the start of the sequestration budget cuts or the fact that we have seen improvement in the level of claims for a few months followed by no real improvement for a number of additional months (start and stop improvements.) Regardless, the improvement in the number of new claims has been pretty consistent in recent years and we are now, effectively, back down to pre-recession levels. Another, somewhat confusing, way to put it is that the level of firing in the economy is at expansionary levels. Now if only we could get the rate of hiring to pick up consistently. 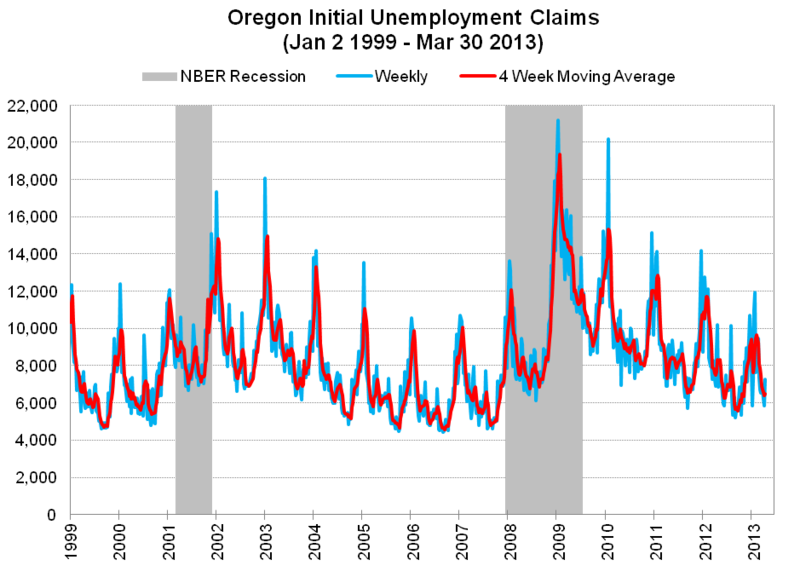 First, this graph shows new weekly claims since 1999 in blue and the 4 week moving average in red to help smooth some of the fluctuations. The improvement over recent years, since the large increase during the financial crisis, is evident. With a time series graph like above, it can be hard to directly compare years. This second graph shows the level of new claims across the 52 weeks in a year. 2008 and 2009 are included to show the elevated levels of claims that really began with the financial crisis in the fall of 2008. 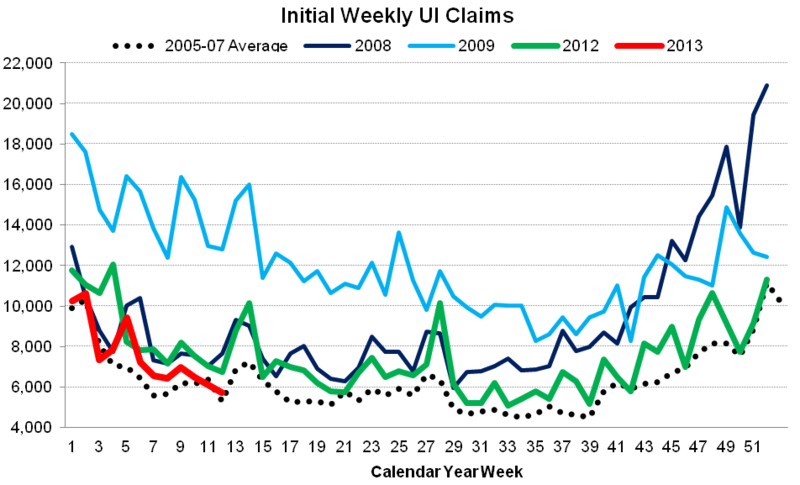 2012 – the green line – for all intents and purposes was back down to the level of claims seen during the past expansion, while so far in 2013 – the red line – we are seeing even a little more improvement. Now, while the level of new claims has improved quite a bit that doesn’t mean everything is well with the labor market – obviously. It is an important step in the process but certainly not the only. In fact, the rate of benefit exhaustion for individuals on the regular program remains uncomfortably high relative to history. 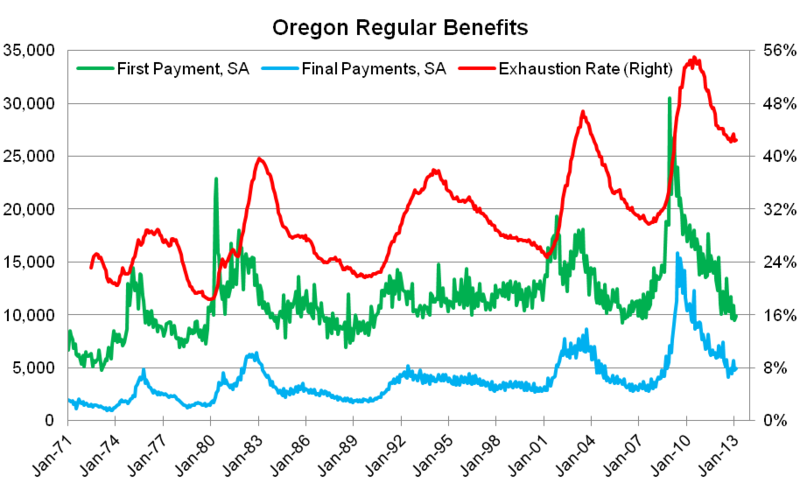 Yes, the level of first payments (green line) is back down, however the number of final payments (blue line) has not followed to the same degree, leaving the exhaustion rate around 42%. That means that 42% of individuals who begin receiving a benefit check, are still receiving them after 26 weeks (the max length of the regular program), presumably because they could not find a job during this time or at least not one they wished to take. This exhaustion rate has decreased from well over 50% a couple years ago, however the exhaustion rate declined into the 25-30% range during the past two expansions in the state, indicating there is quite a bit further to go for a healthier labor market. 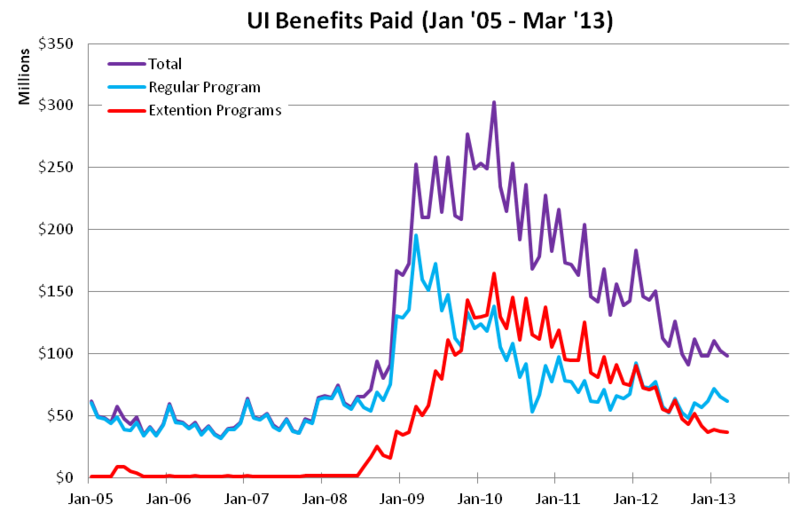 The final graph shows the level of benefits paid out in Oregon under both the regular program and all the various extension programs. Payments under the various extension programs have declined by around two-thirds since the depths of the recession, and are expected to continue to decline over time as both the labor market improves and individuals exhaust their benefits, either because they reach the limit or the programs themselves are scaled back. The regular program benefits are, similar to the level of new claims, nearly back down to pre-recession levels as seen in the blue line in the graph below.